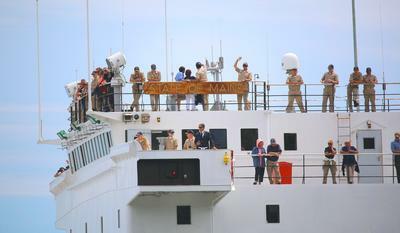 Cadets wave from the ship as it inches into home port. 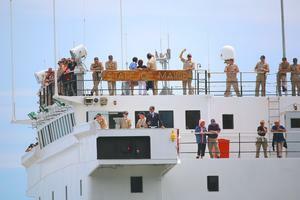 Family and friends of midshipmen who spent 70 days at sea gathered at the Maine Maritime Academy waterfront, waiting for a glimpse of T/V State of Maine to appear in Castine Harbor on July 14. “The anticipation…” murmured one parent leaning against the railing and peering out into the distance. Estimated to arrive about 12:30, the 500-foot vessel stopped in Searsport to pick up parents invited on board for the final leg home, and arrived closer to 1 p.m.
On land, other parents were tracking the ship’s progress for the last two miles of its journey just as they did when the ship was in foreign ports of call. With ports of call this summer in Spain, Netherlands, Portugal, Italy and Spain, the training cruise also gave the 246 cadets on board a taste of the international aspect of life as a merchant marine. Students pursuing U.S. Coast Guard merchant marine certification must participate in two 70-day cruises to fulfill the at-sea training requirement. 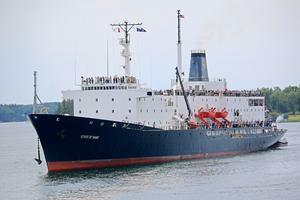 The State of Maine cruises through Castine Harbor as it heads for home port on Saturday, July 14. 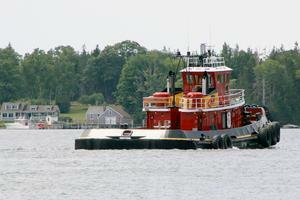 An MMA tugboat heads out into Castine harbor to guide the 500-foot training vessel into port.